Friday was my first KTV experience. In China there are karaoke places that have small individual rooms where you and your friends can go to sit a spell and sing karaoke without having to sing in front of strangers. Singing is not my forte but I tried to belt words and notes that were somewhat close to the artists intended rhythms, mostly ineffectively. I am such a shy person, that it was hard to come out of my shell enough to sing in front of even my closest friends. Everyone else did a fantastic job and even little Levi (3 years old) had a great time. Jim and Kayla sang a couple of duets that were super-sweet. Benjamin and Tammy jammed it up with some song and dance moves, and me, well I was just along for the ride. 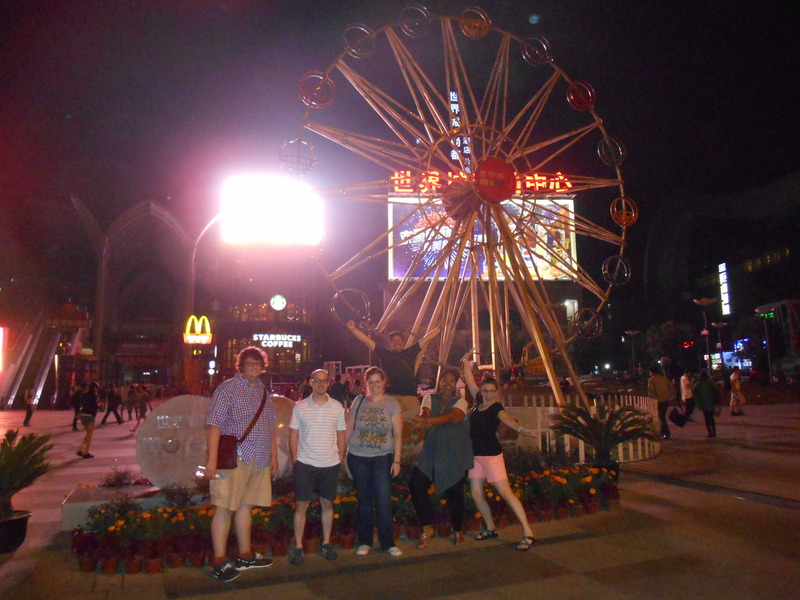 Here’s a picture at Guanggu circle where we all ended up trying to find taxis home, which was tough at that time on a Friday night. Also this week I had my first Mr. Mai’s Coffee Shop experience. 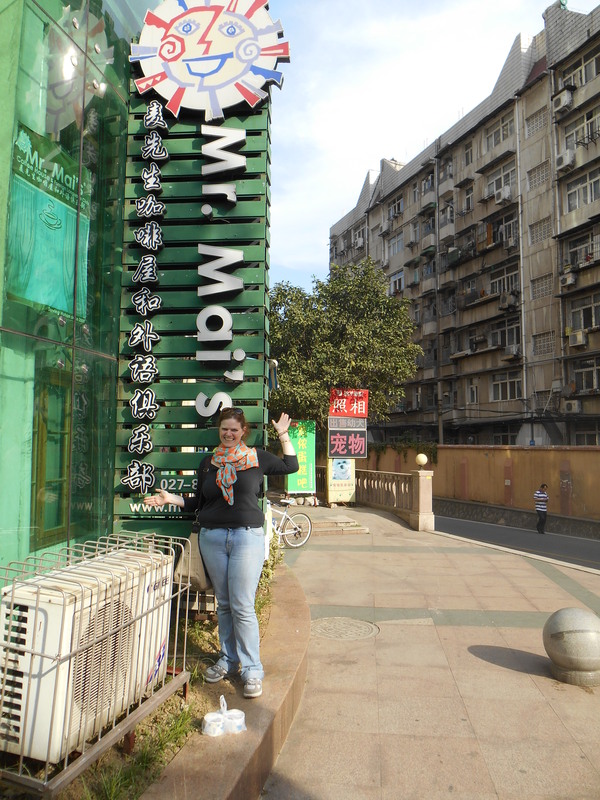 Mr. Mai’s is run by an American couple and designed with an English Language club for Chinese who want to practice their English. They accept native English speakers to volunteer for two hour blocks to come, sit and talk with the customers about any topic of your choice including light religious discussions and provide complementary black coffee, tea or juice for volunteers. I went with Benjamin, Micah, Jim and Kayla. We spread out around the coffee house playing cards and talking with the patrons for a couple hours until it got dark and was time to start heading home. I had a blast. For just a couple of hours I forgot I was in China. I felt at home, so much so that when I walked back outside I felt like I had been transported back into a foreign country. It is such a cool place I will defiantly be going back, and may try to pick one day of the week to volunteer on a regular basis. The last one is a feel-good story for you. Benjamin lost his camera at the fish pedicure place the other day, so after Sunday study we retraced our steps to see if the camera could be located. I told him it was ridiculous to pay the cab fare half way across town to look for a camera that almost certainly had been picked up by another patron and could never be recovered. On a whim we went went back and the owner had saved it for us. As soon as he saw Benjamin (hard to miss the large American guy), he held up his hand like he was taking a picture and said the Chinese word for camera. He immediately went to the back and retrieved the camera that was in perfect condition including the SD card. Wow. I was amazed at the honesty of this Chinese man, and would like to tell everyone — if you ever come to Wuhan, China please visit the Fish Pedicure man on Guangba Lu. 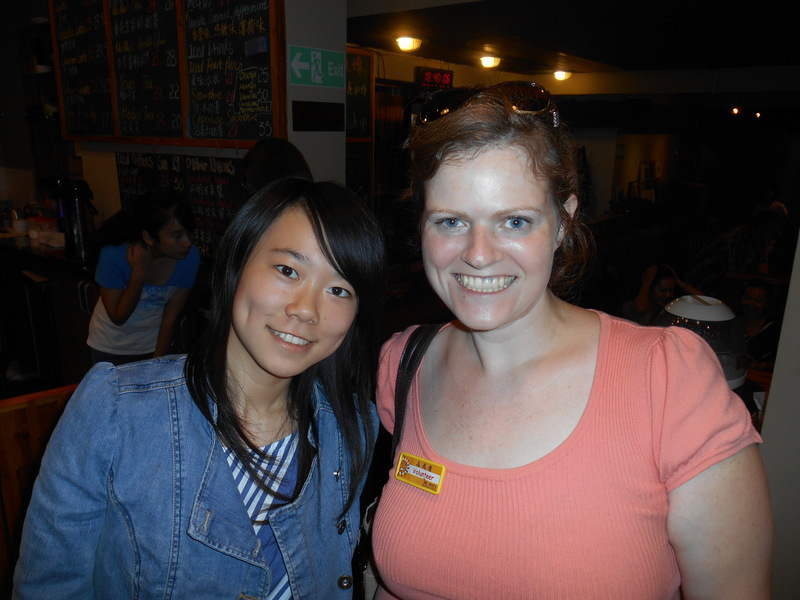 Here is one of my new friends and I at Mr. Mai’s Coffee Shop. I am glad you were able to be transported and feel “at home” for a while! How amazing! I cannot even begin to imagine the fish pedicure-what an experience! you look great in every picture-like you are right where you were meant to be!;). I am very proud of you. Keep up the great work teacher. Mr. and Mrs. Mai are great people. They are members of the church and so uplifting to be around. They have a lot of board games so next time I may try and figure out how to play Settlers of Catan with some of the Chinese patrons. It’s so much fun to make new friends, and everyone I’ve met is so nice. I’m excited to share my values, beliefs and a positive attitude with new people. …and yes, I am exactly where I’m meant to be. G0d uses us wherever we are, and he’s using me in China. Such a good story about the camera being returned to Benjamin. It let’s us know there are good people all over the world. Karaoke sounds like a fun experience. And Mr. Mai’s idea is brilliant. My mind is already thinking of how we could do this in the states. How is Sunday with your family going? Cedar Springs misses you and you are in our daily thoughts. This week is fall break for Bullitt County. I am going to take Heather and the 3 girls to the Big 4 Bridge this afternoon and walk across the Ohio River. Did you get a chance to do this before you left? I have done it twice so far. We have had a lot of rain…in fact Louisville set the record for the 3rd highest rain total in 24 hours on Saturday…5.69 inches I think they said. Thank goodness, Shepherdsville did not receive quite so much or I think we might have had rain in our basement. This morning the low was 49 but it is supoosed to be sunny and 64 today, so I think perfect weather to walk the bridge. I think I will take them to the zoo on Wednesday. I have a package to send you from our ladies class. I will mail it this week. I am a little concerned to mail it if you have not received a card that I sent almost 5 weeks ago. But I am going to do it anyways. Hopefully, a box will have a better chance than an envelope. We will soon see! Make sure when you send the package that you address it to the International Exchange Office, that way it has a specific office and won’t get lost.